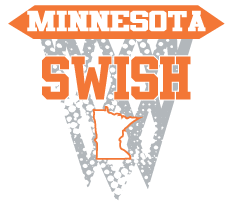 Minnesota Swish is a Twin Cities West Metro spring and early summer basketball club program. Players from all communities and areas are welcomed to try out and participate. to support your team this spring by clicking the button below! Deadline is Monday, April 1st at midnight!!! All tournaments will be Minnesota metro-based with the possibility of swapping to one out-of-state tournament within driving distance (Sioux Falls, Iowa, Wisconsin) and will collect player/family preference on that on the registration form below. Teams will also have the option to add additional tournaments for around $50 per player if a particular team wants to play more than listed above. ​Schedules will remain tentative until after tryouts and may be changed if there is a need to do so due to player or coach coach availability. Level of competition considerations will be taken into account...some teams may play in club-sponsored D1 or D2 division events while others may play in MYAS lower divisions based on the abilities of the team. Athlete tournament availability will be collected on the online sign-up form. Most tournaments are 2-day (both Sat and Sun) events with 3 or 4 games guaranteed. The TEAM pages in the top menu have examples of what 2018 Swish teams played at each age level. There will typically be 2 practices per week with the possibility of having just one over Easter and Memorial weeks or if coach or player schedules dictate. We will take input on practice scheduling from online registration forms or you may bring to tryouts a list of dates to avoid having practices. Cost includes: Two Jersey Tops, Shorts, and a Backpack which are all yours to keep after the season in addition to covering tournament entry fees, coach payment, practice gym expenses, insurance, etc. Although there is no fee to tryout, we will need a commitment by that night by paying the full team fee that you are willing to play on a team if selected. Checks (payable to Hoops Training) or cash are preferable. Can also take credit cards through PayPal.com. Contact AndrewDahl@HoopsTraining.com for credit card option details or payment plan options. - Experience a different role or coaching style and hopefully learn new skills, learn from game situations, and learn to play with more intensity, aggressiveness, and toughness. - Come back an improved player ready to contribute at a higher level in the 2019-20 school or travel season! Not a lot of time will be spent on learning plays that won't benefit athletes in the future. Each team will have a motion offense and keep good spacing on the floor with the option to add a few sets and plays. Defense played will be primarily man-to-man with occasional zones, traps, or presses. Rosters: Nine or 10 players will be selected to each team roster. minutes while still trying to win the game and have the team's top line-up in during crucial times. Coaches: We have a number of excellent coaches returning and lined up for 2019. As of late-January, currently working on matching coaches to teams. There may be a need for a couple more coaches depending on number of athletes at tryouts. Anyone interested in a paid coaching position should contact Andrew Dahl at 651-592-6099 or AndrewDahl@HoopsTraining.com as soon as possible. No hotel rooms (in tournaments where that may be necessary) or transportation is provided. Players & families will be on their own to decide where to stay and/or coordinate rides.